Marilyn Baszczynski, originally from Ontario, Canada, teaches and tutors French in Central Iowa. Gyuri, a work based on the experiences of Hungarian refugees, appears was published in spring 2015 by Whistling Shade Press as part of the Geste Series. Marilyn is currently President of the Iowa Poetry Association. Cameron Bieganek is a Twin Cities scientist who dabbles in poetry. His other interests include soccer, climbing, biking, card games, and sketching. Other short poems by Philip Dacey are collected in Mosquito Operas: New and Selected Short Poems (Rain Mountain Press, 2010). His work also appears in Scribner’s Best American Poetry 2014. Kate Hallett Dayton is a poet and fiction writer. She published her poetry collection, Salt Heart, and a poetry chapbook, Catalpa, in 2013. Her poetry, short stories, profiles, memoir, reviews, essays and travel pieces have been published in a variety of publications, including American Voices, Flyway, The Star Tribune, The Minnesota Monthly, and Nimrod International. Norita Dittberner-Jax is an award-winning poet whose work has been widely published in small press. Her collections of poetry include, Stopping For Breath, published by Nodin Press last autumn; The Watch (Whistling Shade Press); Longing For Home (Pudding House Press); and What They Always Were (New Rivers Press). Richard Donnelly lives in Maple Grove, Minnesota, a last-resort outpost where well-behaved citi­zens dream of the wondrous bohemian nightworld glowing just beyond the horizon. If only we didn't have work in the morning. Mr. Donnelly's first book, The Melancholy MBA, is published by Brick Road Poetry Press in Columbus, Georgia. From 2001 to 2010, Leisha Douglas codirected the Katonah Poetry Series with former Poet Lau­reate Billy Collins and currently serve as poetry consultant to the series committee. Her chapbook, The Season of Drunken Bees, received special mention in The Comstock Review’s Niles 2009 Chapbook Competition. John Grey is an Australian poet, US resident. Recently published in New Plains Review, The Same, Big Muddy and Sanskrit with work upcoming in South Carolina Review, Gargoyle, Mudfish and Louisiana Literature. Ken Haas lives in San Francisco, where he works in healthcare and sponsors a poetry writing pro­gram at the UCSF Children's Hospital. His poetry has been anthologized in The Place That Inhab­its Us (Sixteen Rivers Press, 2010) and the Marin Poetry Center Anthology (2012, 2013). Margaret Hasse, twice winner of the Loft-McKnight Fellowship in poetry, is author of five collec­tions of poetry, including Between Us, which will be published in 2016. Lee Henschel was born and raised in Minneapolis and began his life as a writer in 7th grade. Many of his poems and short stories have appeared in anthologies and periodicals. He's had two novels published, Deja 'Nam, released in 2000, and The Sailing Master, released in 2015. Elizabeth Carothers Herron’s poems appear in West Marin Review, Comstock Review, Canary, and Reflections. She was shortlisted for both the Dana Award in Poetry and the James Hearst Poetry Prize in 2015. Ted King is a jazz poet and performer. He is the author of two books: The Dishwasher, the dancer, and the Subatomic Particle, and New Beat—Jazz Infused Poems. And also a word jazz CD, Close To The Cool. Ted is a member of The Minneapolis Writers Workshop. Jeanne Lutz is a winner of the 2015-2016 Loft Mentor Series for poetry. She grew up on a dairy farm in southern Minnesota, and now divides her time between the family farm and the Minneapo­lis Institute of Art. She is the author of the chapbook Hearts and Harrows, co-written with Richard Donnelly, and her writing has appeared in Conduit, Tinderbox Poetry Journal, Poetry City, USA, and elsewhere. Joe Monfort spends most days working as a corporate sustainability professional and most nights figuring out how to explain what that means at the next family gathering. He was also once con­vinced to attend a Bigfoot sighting testimonial. He left convinced. DS Maolalai is an Irish poet who until very recently lived in London, and now makes his home in a small room in Toronto's Chinatown area. He has been printed internationally in a variety of publica­tions including The Belleville Park Pages, Killing the Angel, and the Unrorean. He is currently unemployed and lives on oranges, music and wine. Rodney Nelson's work began appearing in mainstream journals long ago; but he turned to fiction and did not write a poem for twenty-two years, restarting in the 2000s. So he is both older and "new." Kimberly Nunes’ work is published or forthcoming in The Alembic, Diverse Voices Quarterly, Fic­tionique, Unbroken Journal, and WomenArts Quarterly. Franco Pagnucci, emeritus professor of English at UW-P, has published a chapbook, two short poetry anthologies and five books of poetry. His latest book of poems, Firstborn, is forthcoming from North Star Press in March, 2016. Some of his poems have recently appeared in The Christian Science Monitor, Commonweal, A Year of Being Here, and New Ohio Review. Lauren Raheja has a BA in anthropology from Reed College, works for a food justice organization in the Twin Cities, and was a previous poetry editor for Whistling Shade. Her nonfiction has appeared in City Limits, Brooklyn, The Borough and Grist, and her poetry in Keep This Bag Away From Children. 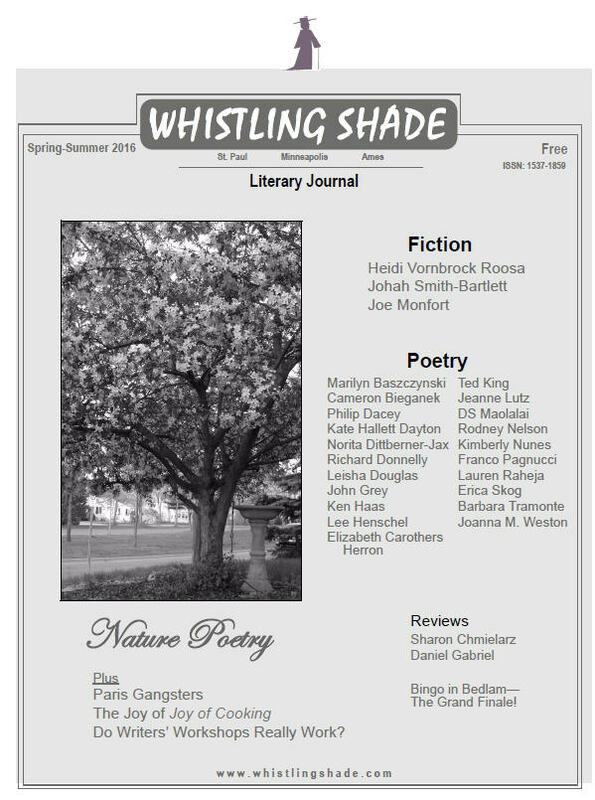 Heidi Vornbrock Roosa's work has been published in Pear Noir!, 3QR, and the South Dakota Review, among other journals. She teaches in the MA in Writing program at Johns Hopkins Uni­versity. Her very large extended family hails from St. Paul and St. Cloud, and she is happy to have a piece of her work coming home to the Twin Cities. Jonah Smith-Bartlett is an American Baptist minister and a California expatriate currently living outside of New York City. 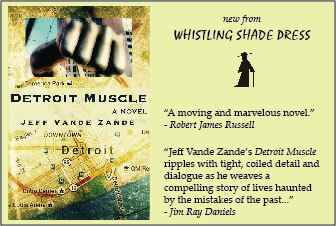 He loves to write about pivotal moments in the stories of small American towns. Cliff Simon was born in Johannesburg, South Africa and spent a year performing at the iconic Moulin Rouge. He is currently a well-known television actor. Among his credits are 24, Castle, The Americans and the NCIS franchise. Erica Skog lives in Little Canada, MN with her husband, Iver. She has a Master's in creative writ­ing from Hamline University and is working on her first book. Loren Stephens is president of Write Wisdom. She was nominated by Forge for the 2015 Push­cart Prize for the short story, “The Sushi Maker’s Daughter,” also the title of her forthcoming novel. Barbara Tramonte is a professor in the School of Graduate Studies at SUNY Empire State Col­lege. She has had many poems published in literary magazines. She was a poet-in-the-schools in New York City for ten years. 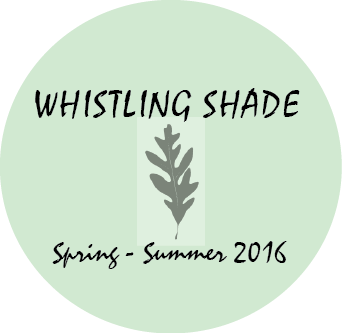 Joel Van Valin is the publisher of Whistling Shade. His recently released second novel, The Grand Dissolute, is a time travel story set in St. Paul in 1998. Joanna M. Weston is married, has two cats, multiple spiders, a herd of deer, and two derelict hen-houses. She has a middle-reader, Those Blue Shoes, published by Clarity House Press; and poetry, A Summer Father, published by Frontenac House of Calgary.